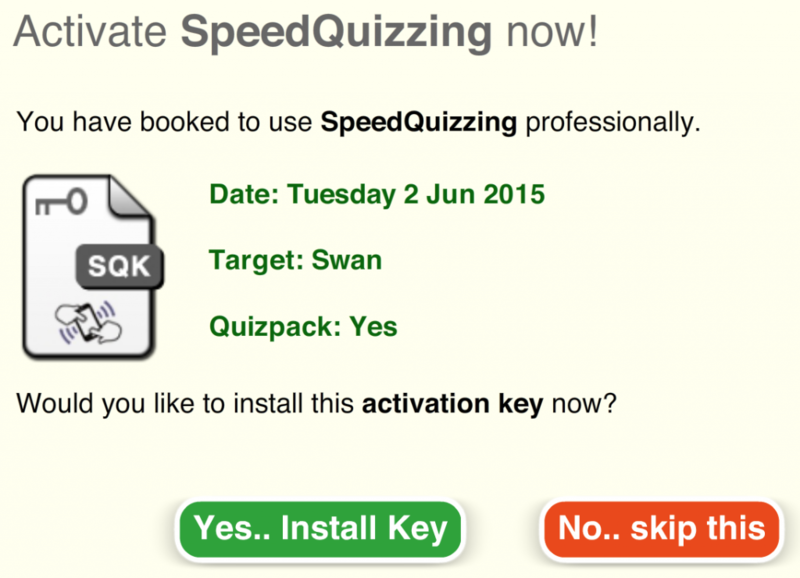 Booking and installing a SpeedQuizzing Activation including Quizpack. A Quizpack is the set of 61 General Knowledge and Trivia questions and answers which is included with your Activation. 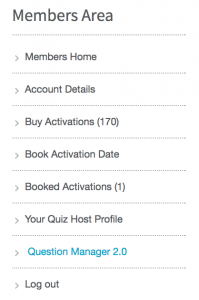 As soon as you set a date for your first paying event you should book an Activation Date for that date including a 61 Question Quizpack. You will also be given the option to fill in your event details which will allow us to promote your event online and also allow you to create a poster using our free online Poster Maker. Booking well in advance is advisable, however in the interests of your Quizpack being up to date with regards to current affairs, you should wait until you are within 36 hours of the date of your event to install your Activation. Prior to V3 of SpeedQuizzing you would have needed to download the activation key and drag it onto the software. However you can now install it automatically using the new Easy Activate feature. 1. Create a SpeedQuizzing user account here if you haven’t already. 2. Authorise your software ready for professional use if you haven’t already. When you open the SpeedQuizzing software click, Authorise and input the same email address and password which you used to create your account along with a name for your computer. Click the blue Close button. You can authorise SpeedQuizzing on more than one computer for backup purposes, but if you do, then be sure to select the correct target computer when booking your Activation. 3. Book an activation for your event. Log into your SpeedQuizzing account here. In the members area you should see your number of paid for activations available. If you’ve not yet purchased Activations you should do so here. Ticking New Venue and filling in your event details will allow us to promote your event online and also ultimately allow you to create a poster using our free Online Poster Maker. Unless you are booking last minute then you probably won’t want to download the activation just yet as it make’s more sense to install nearer to the time of your event. There are different ways to install your activation but Easy Activate is the new easy method which has superseded the old method of downloading an Activation Key and dragging and dropping it on the software. 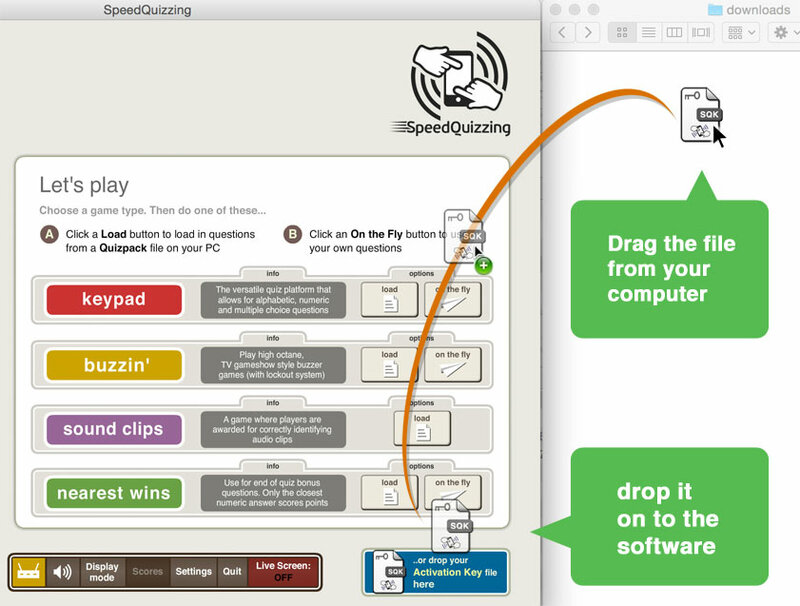 Installing the activation (including Quizpack) using Easy Activate should be as simple as opening the SpeedQuizzing software. (This is one of the few occasions where the software does need an internet connection). Click Yes.. Install Key to install the activation. However do be aware that in order to make sure your Quizpack is up to date you shouldn’t install it earlier than 36 hours prior to the event. Otherwise your Quizpack might contain current affairs questions which are no longer current by the time you come to read them out. To postpone the install click No.. skip this, then you will see the same message again next time you open the software. In addition to this method you can manually check for Activations without closing down the software, simply by clicking the flashing box in the bottom right hand corner of the software…. …which will bring up this Easy Activate/Check now dialogue. Clicking Check now will check to see if any Activations have been booked since the last time the software was opened. The downloading, dragging and dropping method will still work, however it is now likely only to be used on rare occasions where you can’t get internet access to the host computer. 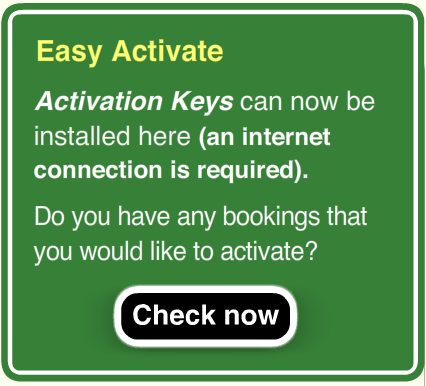 You can download your activation key in the Your Activations section and it will also get emailed to you on the morning of the event, however since the introduction of Easy Activate it’s unlikely you’ll need to use this method.